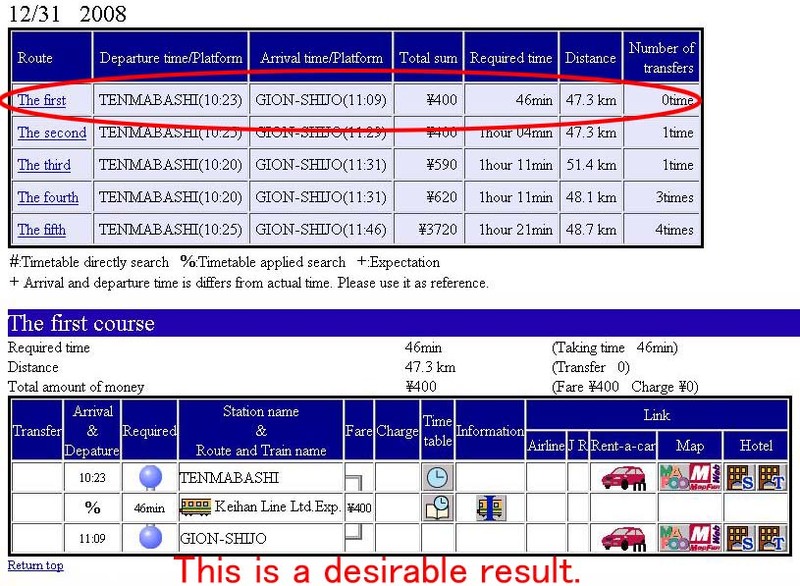 Looking at several online travel forums, I often notice people struggling to get optimal train connections on the Hyperdia site. Apparently the site very often shows whimsical results, I mean useless connections. So this time I try to make you get the hang of how to cope with and how to obtain optimal connections from it. 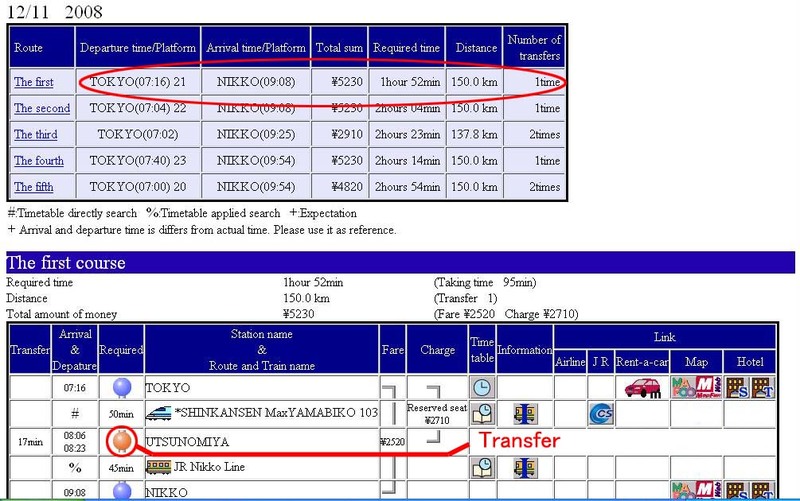 (1) If you travel from Nagoya Chubu International Airport (NGO) to JR Nagoya Station, just enter (from) 'Chubu International Airport' (to) 'MeitetsuNagoya' to get a schedule. 3. Then you get a result. 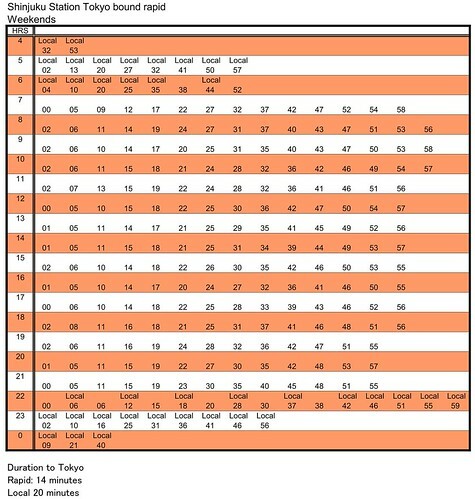 (2) If you travel from Fukuoka City to Hiroshima on the Japan Railpass, you should make sure you enter (from) 'Hakata' Station, not 'Fukuoka' Station. Fukuoka Station is located on the Hokuriku Line, totally different a place. 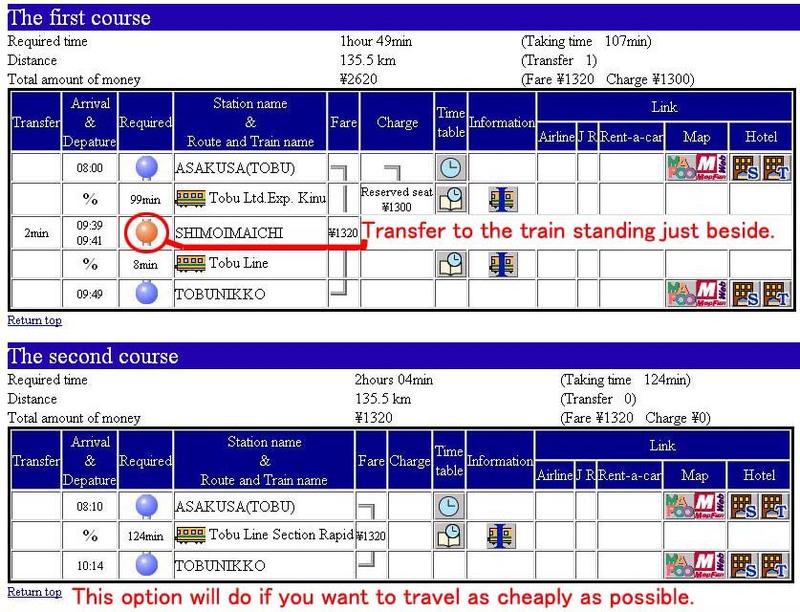 Also you need to tick 'Except Nozomi' because you can't take the Nozomi train on the pass. 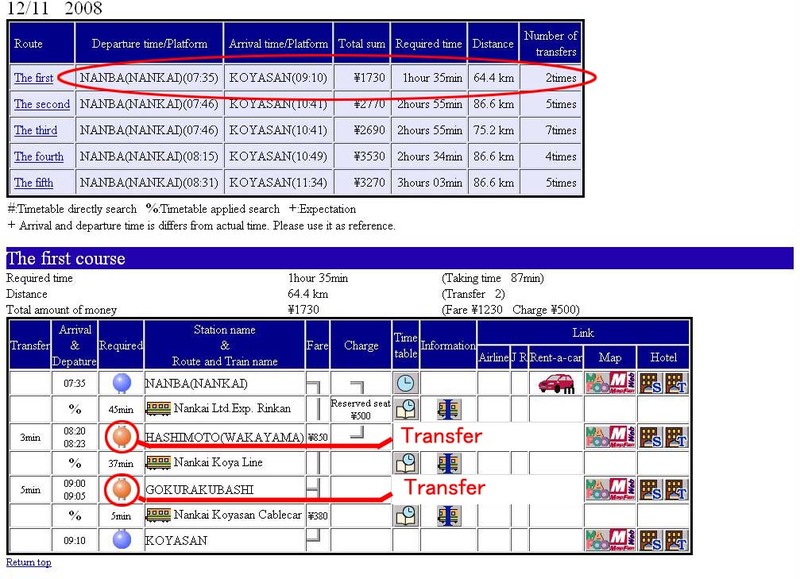 (3) A case where you travel from Osaka Namba to Koyasan. In the Japanese Language, when the pronounciation 'n' is followed by 'b' in a word, it makes an euphonic change to 'm' as in 'wombat' in English. Hyperdia now uses 'Namba' rather than 'Nanba'. If you search a schedule from Namba on Hyperdia, make sure to enter 'Namba'. Sorry for the confusion. 3. You get a result. (4) The case where you're heading from Shimbashi to Narita Airport on Toei Asakusa and Keisei Line via Aoto in the cheapest and in a convenient way (You have to change trains only once, and the transfer can be made on the same platform: In this case, Hyperdia requires you to enter 'ShiMbashi' rather than 'Shinbashi'. Very tricky indeed. (5) The case you head from Shinjuku to Nikko: If you simply enter 'Shinjuku' and 'Nikko', it only shows a route via Omiya instead of Tokyo. It looks an unnatural way to travel on that segment to me. Tokyo Station is the terminus on the Tohoku Shinkansen. A. If you have a JR Pass, you might travel by JR all the way. 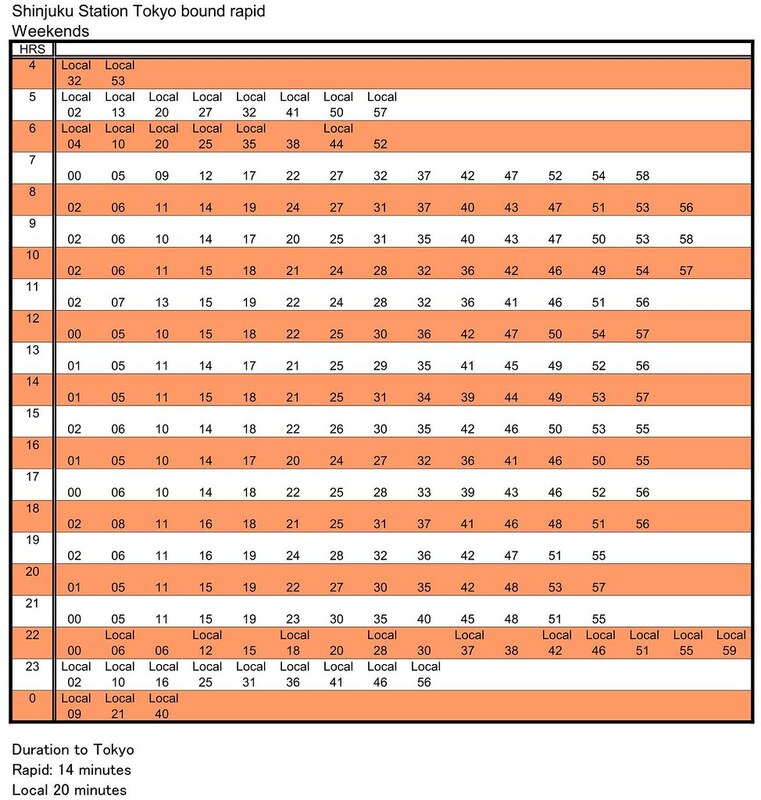 You better take the Chuo Line rapid train from Shinjuku to Tokyo, then change to the Tohoku Shinkansen to Utsunomiya. I mean, you should enter 'Tokyo' and 'Nikko' onto Hyperdia to get a connection. B. If you don't have a JR Pass and want to travel from Shinjuku to Nikko as cheaply as possible, you might head to Asakusa, purchase an unlimited travel pass for the Nikko at Tobu Tourist Center, then catch the Tobu Line train to Nikko. 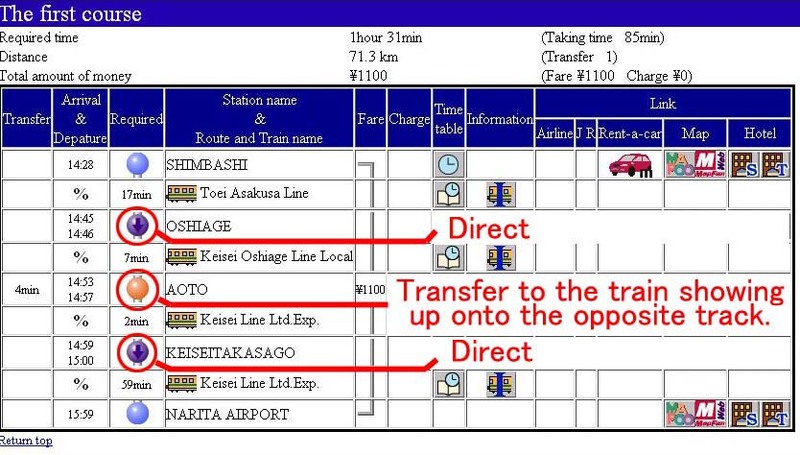 In order for you to get from Shinjuku to Asakusa, there are two major ways. 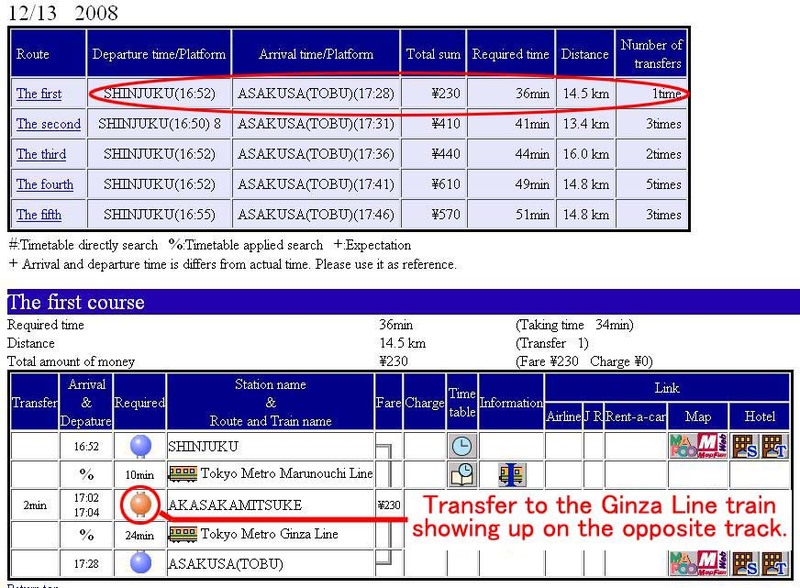 a) Take the Chuo Line rapid train to Kanda, then transfer to the Metro Ginza Line to get to Asakusa. This is faster than the other. b) Take the Metro Marunouchi Line train to Akasakamitsuke, transfer to the Ginza Line train showing up onto the opposite side of the platform to get to Asakusa. 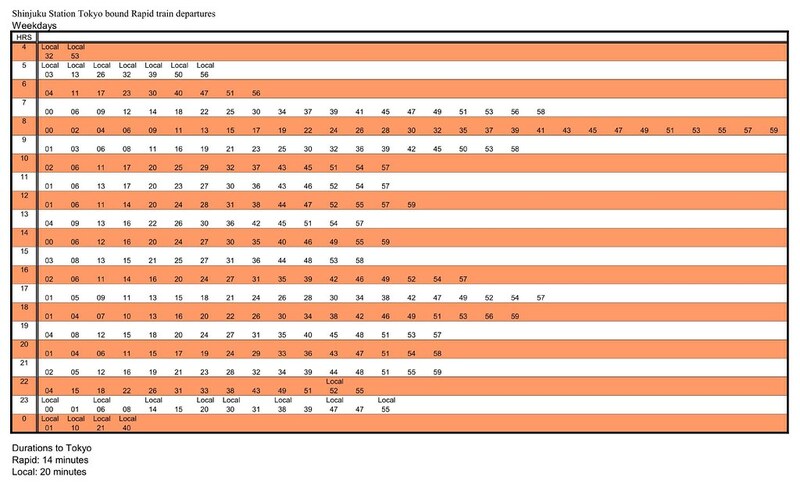 This is less confusing in transfer, but takes more time. Then finally search a connection from Asakusa to TobuNikko. An absolutely invaluable resource, Optimistk! I really do hope that people appreciate the sheer amount of effort you put into your posts and providing help for people to help themselves. It seems Hyperdia now prefers "Namba" instead of "Nanba". I tried "Nanba" and it can't find that station. Thank you very much for the updated info on "Namba".